Promise me an eye liner that won't budge and I'll answer: I'll believe it when I see it. I'm one for affordable make up, I just don't see the point in spending a load of money in a product just for the brand, with the exception of a few products. One exception being a good lasting eye liner. I leave my house around 8.30am and I return around 6.30 pm, and that is if I'm not going to college, in which case I return around 10pm, therefore I need an eyeliner that I can trust to stay put throughout the day. I bought this beauty after reading a couple of reviews and to be honest, on a day I had quite an encouraging discount. 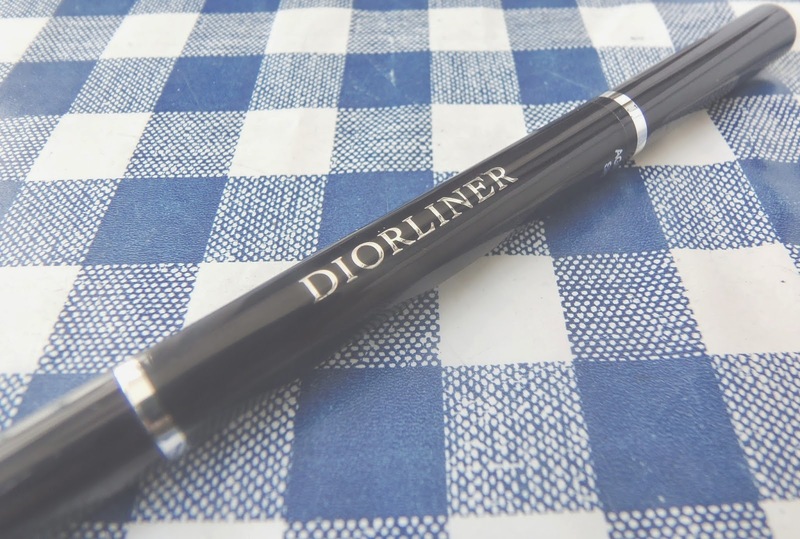 After using the DiorLiner Precision Eyeliner, I can say it was money well spent, not only is it super easy to use, but the tip is super sleek and doesn't go soggy after some uses (like a lot of other pen-format liners). Another thing I really like is that the product doesn't come out unless you twist the bottom, making not only super travel friendly but also really lasting (in the tube), putting an end to the "I have to use up this product before using a new one because it will dry up". This is really great to do a nice feline flick or just to thicken the lashes a bit. My only advice is let the product dry: as this is a liquid liner, if you want to blacken it a bit more, you need to let it dry a bit, and then you can add more product on top without any problem. As the price tag is a bit of a let down, I will try and find a drugstore dupe for this bad boy, but If I can't, I can swear it will be repurchased. What's your favourite eye liner? I'm currently using a Gemey Maybelline eye liner, but L'Oréal is great too! Sounds like a good eyeliner! I usually use a eyepencil from Sephora or eyeliner from YSL. A mi me encanta Dior es maravilloso! finding a good eyeliner is hard! lately, i've been brushing on eyeshadow as liner with a brush, but i'm always looking for a new one to try! I love it, I should buy it. This eyeliner looks great, Dior make up is so good, I have some lipsticks and I love it. Thanks for stopping, do you like to follow each other? Just let me know hun! I have a few go-to eyeliners I fall back on from the drugstore but I wouldn't say they last as long as the Dior one. I really like the Revlon liquid pen eyeliner as I find that it lasts the longest of my drugstore eyeliners but definitely not as long as an 8:30 to 6:30 day (at least not without a touchup in the middle). It looks amazing on you! A bit pricey though! Nice review. :) I got something like that too but it's from the faceshop. I'm so crazy about eyeliners that's why decided to have a permanent eyeliner cosmetic. I still use eyeliners like these when I want a thicker line. Nos encanta, pasate por nuestro blog guapisima!